Is The Exotic Shorthair Cat Good For You? The Exotic Shorthair cat is most known for their loyal and easy going nature. Males tend to be more dependent and affectionate than their female counterparts. Exotics love people but are wary around strangers at first. A short haired version of the Persian, the Exotic Shorthair was first recognized as their own breed in 1967. 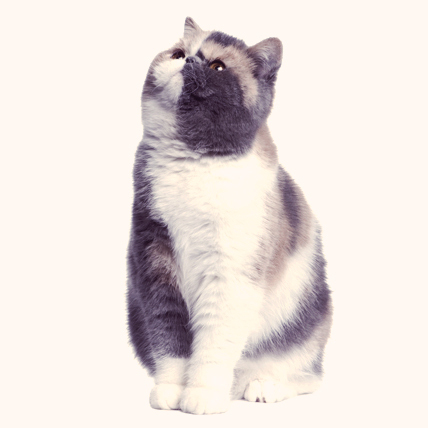 A cross between the Persian and the American Shorthair, the Exotic Shorthair maintains all of the Persian's unique characteristics, minus their long fur, making them quite sought after. The Exotic Shorthair is a cuddly, flat-faced mush. Their luxuriant short coat comes in a wide variety of colors and requires little grooming. Their flat face and big, round eyes make them look like the feline equivalent of a Pug dog. They have a round, plump body and a stubby neck that, in conjunction with their flat face and big eyes, makes them look like they are going to tell you how much they hate Mondays, and then push Odie off a table (they look like Garfield). The Exotic Shorthair has all the gentleness and calm of their Persian ancestors, but are a little bit more active and playful. They have a pleasant temperament and get along great with other pets and kids. They are a quiet breed that enjoys the company of their owners, loathing any long stint alone. They don’t require a lot of space, making them ideal for apartment life. While they are calm, they also hold up the torch of their feline predecessors, being an adept mouser. A great companion for the elderly living alone. The Exotic Shorthair comes in a wide variety of colors and patterns.